We have tried to change out the dll for our application to a newer dll (9.0.0.335). When we do this, our application no longer works. Our application is used for reverse geocoding. We noticed the the file size seems significantly smaller than the 9.0.0.142 version. I checked the releases and since this isn't a major release, I don't see the documentation. The main function we are using is geocoder.match. After doing some tracing through the program, it looks like we aren't getting values for state and city for the array that is returned. Did those names change perhpas? I compared with the two version and didn't found any changes and I found there are many changes between Development version. Please make sure that you are using Production Version 9.0.0.142 and 9.0.0.335. Could you please provide us your data or where do you search? This image shows the size of the two version and there is no changes. Thanks! I went back and looked again and it looks like it is actually the 9.0.0.0 version which is what we got when we first bought our license. I tried to upload the DLL, but it wouldn't accept that file extension. I did some tests with our data and was unable to recreated your issue. Could you please provide a sample to help us to recreated this issue? Attached is the screenshot shows the test results, the upper shows the result by referencing version 9.0.0.335 and the lower shows the result of version 9.0.0.142. This issue may be caused by the Geocoder files? 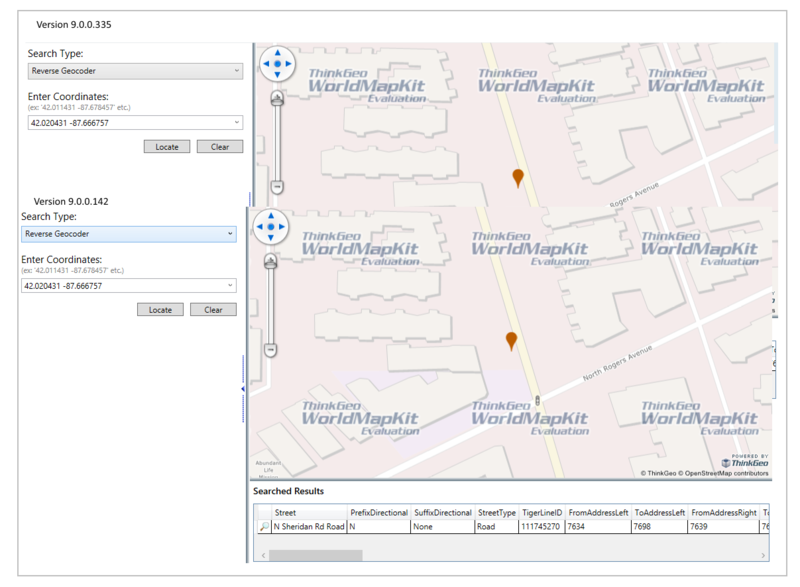 Do you use "GeoCoderIndex 2015 v2" in the application? The release versions support the old Geocoder files, but not supports the "GeoCoderIndex 2015 v2". In order to support the "GeoCoderIndex 2015 v2" format files, we did many changes in development branch, but these changes are not merged into the release branch. Attached shows the file information of Geocoder "GeoCoderIndex 2015 v2". If it's not the point, could you please tell us how to reproduce this issue? Such as, the input address or lon/lat. We are using GeocoderIndex 2015. We got an updated dataset from sales on 2/25 and that is the index that came with it. We get a zip and address to come back, but no state or city. I guess the "GeocoderIndex 2015" used in your application is the same one as my mentioned "GeoCoderIndex 2015 v2". Please try using development branch instead. I got the news from our manager and these changes will be merged into Release branch in version 10.0 which will be published this year. Based on the file sizes and dates, we think it might be V2. 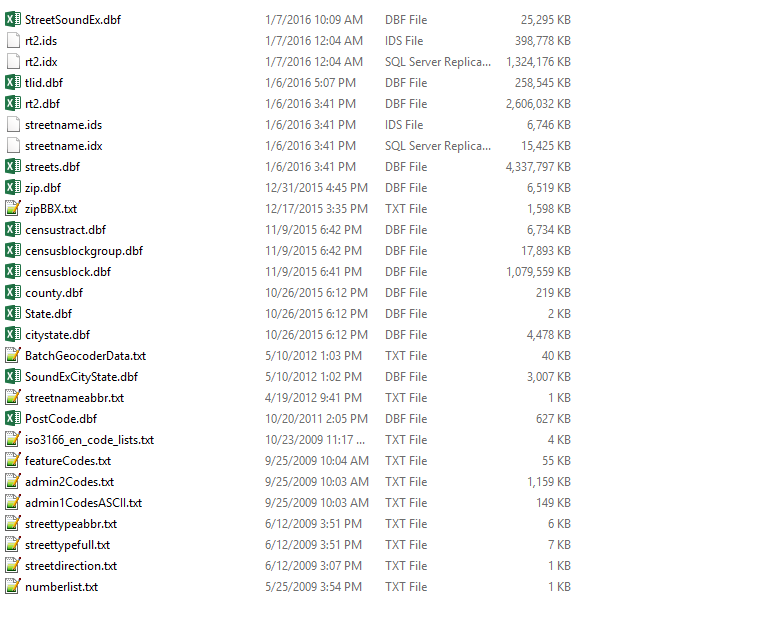 Do you see any issues with us using the development branch dll for our prod product? We did validate that it works. Just recreated your issue with our data in release branch and development branch works well. okay, so just to confirm. You don't see any issues with us using the development version for our prod product. I think somewhere it cautions you on doing that. We are using it in development now to test it, but just want to make sure this is a good interim solution until release 10 comes out. It's OK. Please wait for the release 10.0.